As the summer was nearing its’ end here in the Pacific Northwest, my husband and I were itching to get outdoors a few more times. Last month we woke up to a beautiful, sunny Saturday in Seattle with no agenda. We spontaneously threw our camping gear in the car and headed east over Stevens Pass. Our plan was to head into Leavenworth for a few supplies and go from there. As we approached Leavenworth, we noticed smoke filling the skies above the city. A large fire was burning alongside the hills to the northeast of town. Helicopters were scooping large buckets of water out of the Wenatchee River to dump onto the fire and emergency vehicles were coming into Leavenworth from all directions. After a brief stop in town for supplies, we stopped at a local coffee shop and asked our barista for camping suggestions. She led us towards Icicle Road explaining that it was the best camping around. 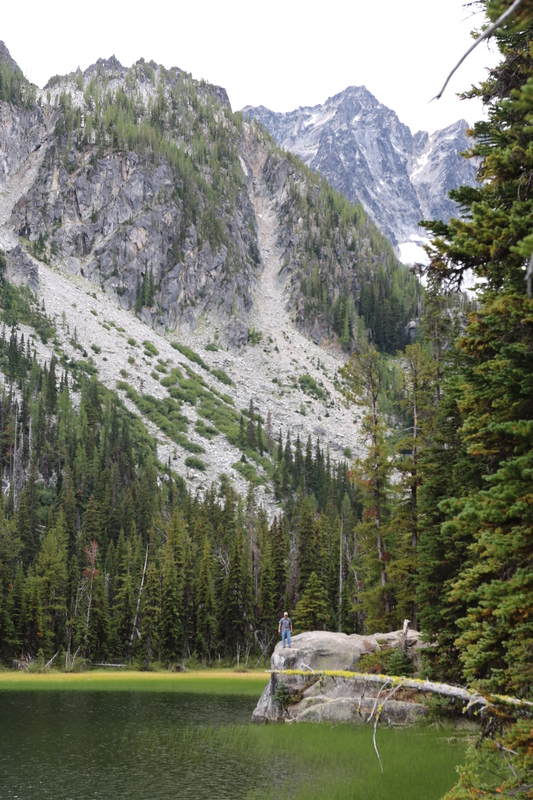 Without knowing it, she had led us straight into the Enchantments for our very first time! 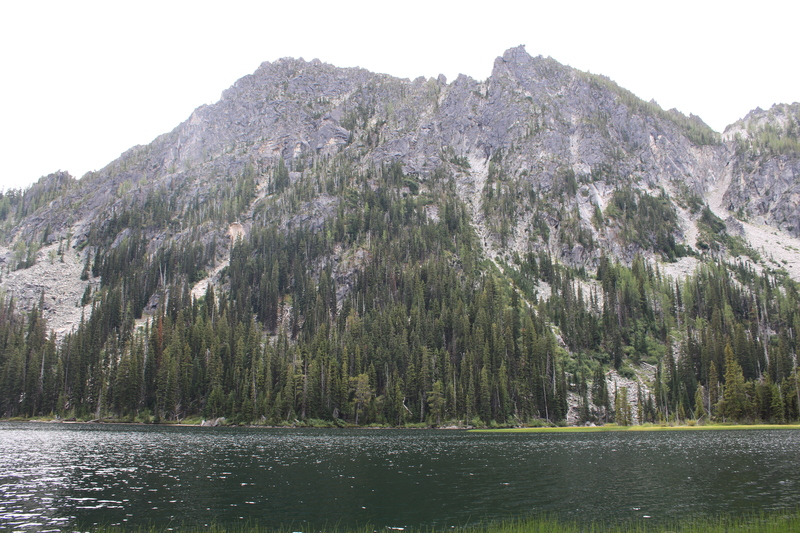 I have read about The Enchantments online, and even applied for a backpacking permit in the lottery this year, but didn’t actually know where it was located. The drive along Icicle Road is breathtaking as it winds its’ way through the valley along Icicle Creek. Craggy mountain peaks surrounded us in every direction. Out of curiosity, we stopped at a trail-head parking lot only to find we were at the entrance into the Enchantments via Snow Lakes. What I have only read about until this point, was now directly in front in me! I was almost giddy from the excitement of wanting to hike these trails. 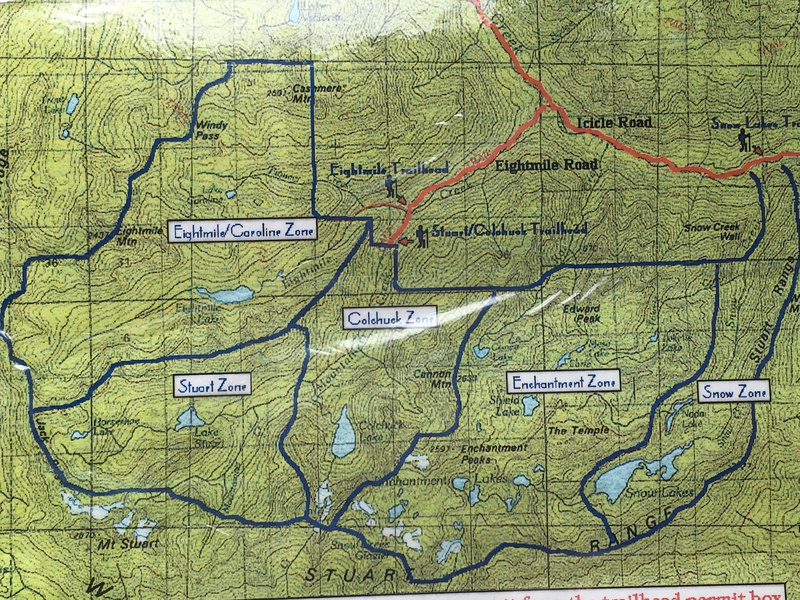 I snapped a quick picture of the map at the trail-head before hopping back in the car. Our plan was to find a camping spot along Icicle Road and take a short evening hike as the sun set…but unfortunately, things didn’t go exactly as planned. Every, single camping site was full (with the exception of dispersed camping which we weren’t prepared for.) We made our way all the way to the end of the road stopping at each campground checking availability. As we headed into one of the most beautiful areas on one of the most beautiful weekends in the PNW that morning, we were prepared for this. Our backup plan was to head into Leavenworth and have a local brew and use the breweries’ WiFi to find a hotel to crash in for the night. Before heading back out of the valley, we stopped at a quite picnic spot to enjoyed dinner beside Icicle Creek. By the time we arrived back in Leavenworth, the sun had completely disappeared behind the mountains. It was when we finally arrived back in town that our plan really started to fall apart. The fire that had starting burning earlier that day had the entire city without cell service and WiFi. After enjoying a quick pint at Icicle Brewing Company and discovering our latest challenge, my husband and I made our way around town on foot hoping to find cell signal or accommodations. In one brief moment of cell service, we sadly discovered that every, single hotel room was booked in town. Our last hope was to see if the KOA had availability or was even open that late at night, as it was nearing 10:00 pm. We pulled into the KOA full of doubt, but to our surprise the campground was open and had plenty of availability. There was one minor problem – the campground was on a Level 2 Evacuation because of the fire burning on the hilltops just across the river from the campground. This meant we would need to be ready to evacuate within 15 minutes if notified at any time during the night. Preferring not to make the drive back to Seattle at such a late hour, we set up camp and the Leavenworth KOA and called it home for the night. My husband and I reminisced about our very first camping trip in WA during a vacation over four years ago. Before calling it a night, we took a short hike down to the Wenatchee River that flows alongside the campground. Across the river along the tops of the hills, the glow of the fire could be seen against the nights’ sky. The next morning we woke up safe and sound, and were excited to head back into the Enchantments for a day hike. After a quick breakfast, we broke camp and made our way into the mountains once again. Now that I knew I was going hiking in the Enchantments, I looked in my WTA backpack and found the hike description for Lake Stuart. I have seen many pictures of this hike online, and now it was time to see it for myself. We drove back down Icicle Road this time turning onto Eightmile Road towards the trail-head. Our car climbed deeper into the mountains along a narrow, dusty forest road. As we pulled into a mostly full parking lot, we were thankful to have arrived early enough to have access to a space to park our car. It was the perfect day for hiking in the PNW! 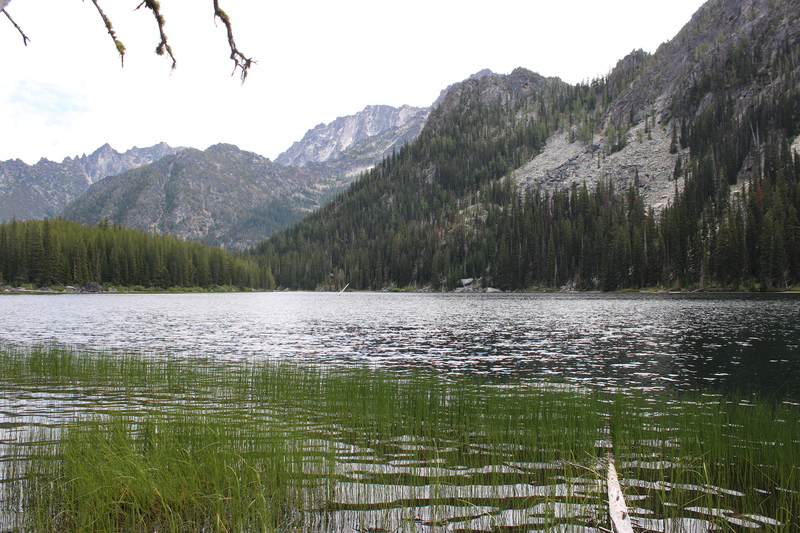 We were filled with energy as we stepped into this new and unfamiliar territory known as the Enchantments. The first two miles of trail are shared with hikers headed to Colchuck Lake, a much steeper hike up into a different valley. We chose to hike to Lake Stuart in hopes that it would be a little less crowded since it is a slightly less popular destination. The trail was packed with trail runners zipping by as they made they way back towards the parking lot from an unknown distance out of the mountains. It was not our intention to run this trail, but the excitement of trail runners grinning as they ran by had us pumped to do the same. We decided right away we would hike up to Lake Start and trail run our way back down. We continued along the trail slowly climbing into the valley switching back and forth between trees and boulders. 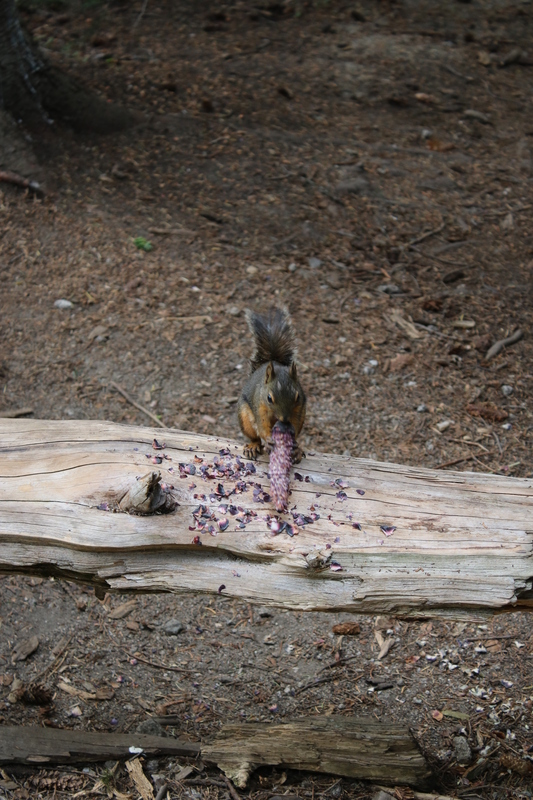 At some point we stopped for a quick snack and watched a squirrel break for lunch as well. It wasn’t long before Lake Stuart came into view and dominated the landscape. The blue waters reflected the craggy mountain peaks and the bright green grass along the shoreline. I quickly ran to the edge of the water and took off my socks and shoes. The cold water felt amazing on my tired feet from the hike up. As I dug my toes into the sand, I noticed specks of glittery flashes reflecting from the sun. With further investigation, my husband and I noticed tiny specks of gold like flakes all throughout the sand along lakeside. I hate to make such a cliche statement, but it truly was an enchanting place! After a quick lunch, I slipped my shoes back on ready to explore the trail along the shoreline of the lake. Perfect little camping spots were tucked beneath the trees along the edges of the water. Large boulders jut out into the water creating the perfect viewing spots with mountain peaks in every direction. We knew at some point we would have to leave the beauty of the lake behind us, but were excited about the adventure of running back towards the trail-head. With our packs strapped on tightly, we headed down the trail filled with enthusiasm. Since I had not been trail running on a regular basis, I cautiously picked each step between the rocks and tree roots that covered the pathway. As I gained confidence, I picked up my pace as the trail zigged and zagged its’ way through the valley. Like the runners I had seen earlier in the day, I was now grinning from ear to ear myself – this was my happy place! Just as I was feeling most confident in my footing, rocks suddenly slid beneath my feet causing me to dive forward onto the ground. I quickly pulled myself up off the rocks as to avoid embarrassment from the nearby hikers. I took a short glance at my right elbow and saw a stream of blood pouring down my forearm. At this point, I thought it’d be best to ignore the pain and just finish the hike at a slightly slower pace. 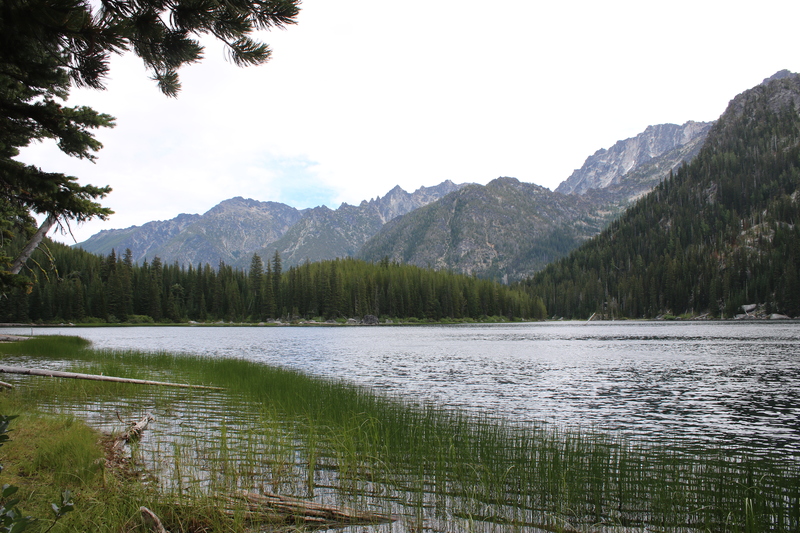 It wasn’t long before the cars in the parking lot came into view, and our journey in the Enchantments was ending. My husband doctored the few wounds from my earlier crash including two cuts on my arm, a small gash on my pinky finger, and a little road rash on my knees. Even with my small injuries, the hike to Lake Stuart was one of my favorites to date! 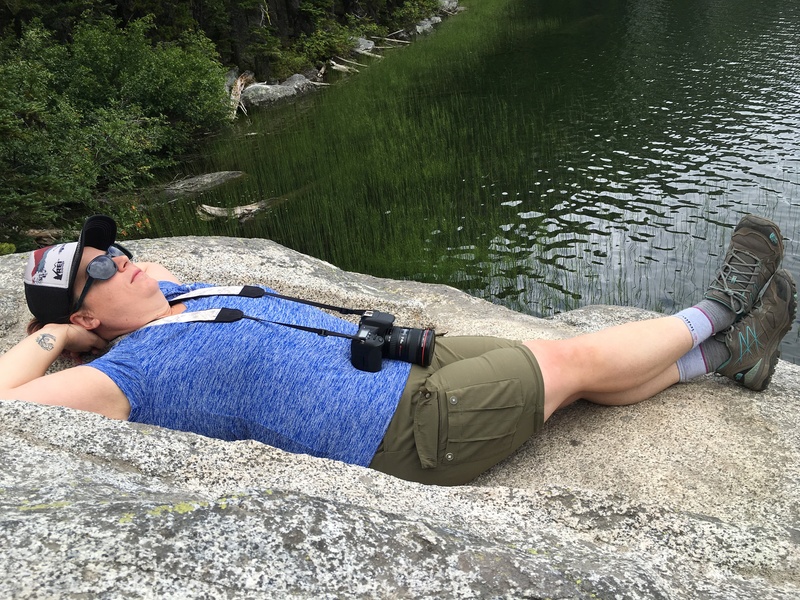 I knew that was the first of many adventures I was going to have in the Enchantments. As we headed back to Seattle, we instantly began making plans for the following holiday weekend to return to the Alpine Lakes Wilderness. 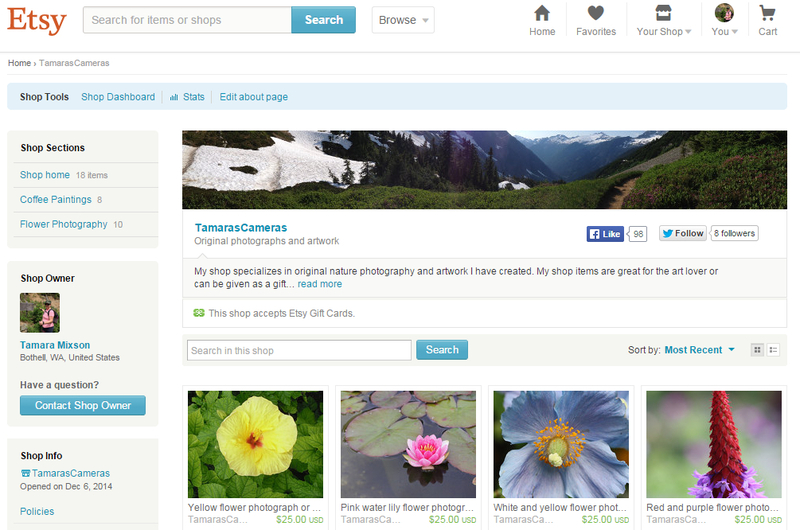 This entry was posted in Camping, Hiking, Nature, Panoramics, Photography, Running, Travel, Video and tagged Alpine Lakes Wilderness, Car camping, day hiking, digital photography, Icicle Creek Valley Road, KOA campground, Lake Stuart, landscape photography, Leavenworth fire video, PNW Pacific Northwest, squirrel photography, tamarascameras, The Enchantments, trail running, WA Washington state, Wenatchee River, wildlife photography. Bookmark the permalink. What a crazy and enchanting adventure. Fires, no place to stay and then a crash landing. Keep searching and finding new journeys.